KawaiiPunk - Kawaii Mascot Blog: Sounds Search! New Wave Mascot! Fantastic, isn’t it? 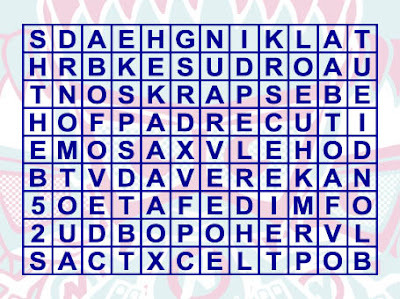 As you can see this particular word search has been made in honour of my friend and colleague the New Wave Mascot, and in it are hidden eight of the New Wave Mascot’s favourite bands! But wait, I hear you say, how am I supposed to know what bands the New Wave Mascot likes? Well, here’s a clue: he’s called the New Wave Mascot - what sort of bands do you think he’s going to like? Honestly, sometimes I think I make these puzzles too easy for you :) Find out if you found all eight bands when the answer is revealed in this month’s monthly round-up!